What a day! The sun was out and I was out – in the man cave and then the garage! The predicted snow didn’t arrive, and I can’t say I was disappointed, but I was smiling. There was blue sky, the birds were singing and there was a beautiful sound of a 80 toothed Snap On ratchet hard at work! I decided to remove the Brake Drum and backing plate to get it cleaned up ready for the new parts. I have taken lots of pictures and quick step by step process of what I have done. I was not to happy this morning though, I heard the postman, I run to the door and got a bill. Not the hammer I’m, just a bill. I was going to give somebody grief on Monday morning, but changed my mind and brought the day forward to today. I called the company, polite – but the bloke was not the shiniest spanner in the tool box should I say. Anyway, I explained the hammer hadn’t turned up and I was expecting it two days ago. He looked on his system and found that my hammer was awaiting a restock. They never emailed me to tell it was out of stock, to make it worse he couldn’t tell me when it was going to be back in stock either. Their advertising states, always in stock – Failed, they also say next day delivery – Failed. So I suggested that he should give me a refund as I aint happy. Fair enough the refund came through about an hour later, but I am looking forward to giving some negative feedback, oh yes! So as the wife was going out she asked if there was anything I needed as I think she felt sorry for me. To which you can probably guess the response – a hammer? We phoned a local company that specialises in tools, they had some in stock which I duly reserved. The wife picked it up and brought it back after her shopping. It was also cheaper than eBay! I got it in my hand about 1/2 hour before I actually needed it. Perfect timing. The smile just got bigger. The Brake unit removal was a good piece of work today, The whole brake unit is now in my man cave ready to be cleaned. If you want to know what a fully rusted set of drum brakes looks like on a 66 Mustang click here, or go to the Photos section/Wheels & Brakes. This was Part 1 to remove the drum, Part 2 will be to remove the old bits and clean, finally part three will be the rebuild and refit. What shall I do tomorrow? I reckon if the weather is nice I may finish of the Brake booster ready to refit, if it’s not I will clean the first part of the drum up. I just can’t plan anything thing with this weather. According to the news on this side of the “pond” the USA is getting battered by snow. Is it really as bad as they say? 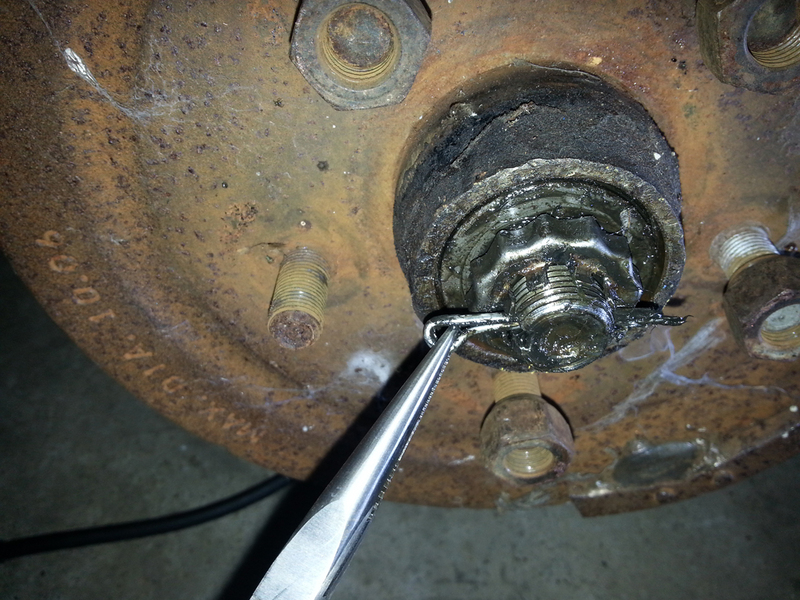 This entry was posted in Blog, Car, Photo's and tagged bill, birds, brake booster, brake drum, garage, hammer, man cave, Mustang, postman, refund, Snap-On, snow, spanner, wheels. Bookmark the permalink.